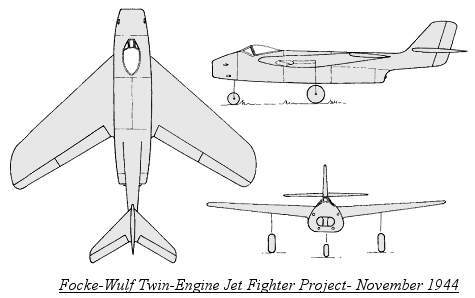 This Focke-Wulf project was submitted by Professor Kurt Tank in late 1944 for a twin-jet fighter which could be used as a fighter, fighter/bomber or long-range fighter, and was to be constructed entirely of metal. The RLM number of 250 was assigned to this project, which had previously been held by the land version of the hugh Blohm & Voss BV 238 flying boat. The fuselage was wide, to accommodate the nose air intake for the twin Heinkel Hirth He S 011 jet engines that were buried in the rear fuselage. The wings were swept back at 40 degrees, with the main landing gear retracting inboard into the wing. Mounted on a "boom", the tail unit was set high in order for the jet exhaust. A single pilot sat in a pressurized cockpit located near the nose. Armament consisted of four MK 108 30mm cannon or four MG 213 20mm cannon. Also, a droppable load (supplemental fuel container) of 1000 kg (2200 lbs) could be carried by the long-ranged fighter variant. Further testing and work would doubtless have been needed on this project, for example, the long air intake would have resulted in a loss of power, but this could have been overcome by using leading edge or wing root air intakes instead. Even though it would have been superior in climb and turning ability than the similar Messerschmitt 262 HG III, the Focke-Wulf project would have been slower and would have a longer design-to-prototype time than the Me 262 HG III. All design work was ceased in order to concentrate on Focke-Wulf's Ta 183 single jet fighter. The information learned during this project's design was later used in the Fw J. P.011-45 and Fw J.P.011-47 jet powered night and all-weather fighter projects.